KOMOS (Comus) was the god of revelry, merrymaking and festivity. He was the son and cup-bearer of the god Dionysos. 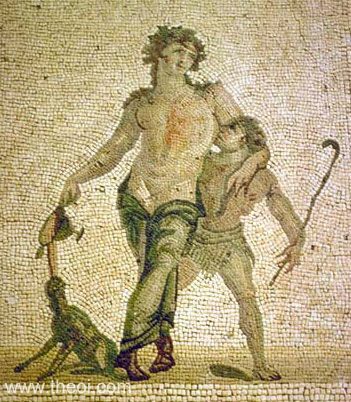 Komos was depicted as either a winged youth or a satyriskos (child-satyr) with balding pate and asses' ears. COMUS (Kômos), occurs in the later times of antiquity as the god of festive mirth and joy. He was represented as a winged youth, and Philostratus (Icon. i. 2) describes him as he appeared in a painting, drunk and languid after a repast, his head sunk on his breast; he was slumbering in a standing attitude, and his legs were crossed. "[Ostensibly a description of an ancient Greek painting at Neapolis (Naples) :] The spirit Komos (Comus, Revelry), to whom men owe their revelling, is stationed at the doors of a chamber--golden doors, I think they are; but to make them out is a slow matter, for the time is supposed to be at night. Yet night is not represented as a person, but rather it is suggested by what is going on; and the splendid entrance indicates a very wealthy pair just married who are lying on a couch. And Komos has come, a youth to join the youths, delicate and yet full grown, flushed with wine and, though erect, he is asleep under the influence of drink. As he sleeps the face falls forward on the breast so that the throat is not visible, and he holds his left hand up to his ear. The hand itself, which has apparently grasped the ear, is relaxed and limp, as is usual at the beginning of slumber, when sleep gently invites us and the mind passes over into forgetfulness of its thoughts; and for the same reason the torch seems to be falling from his right hand as sleep relaxes it. And for fear lest the flames of the torch come too near his leg, Komos bends his lower left leg over towards the right and holds the torch out on his left side, keeping his right hand at a distance by means of the projecting knee in order that he may avoid the breath of the torch. While painters ought usually to represent the faces of those who are in the bloom of youth, and without these the paintings are dull and meaningless, this Komos has little need of a face at all, since his head is bent forward and the face is in shadow. The moral, I think, is that persons of his age should not go revelling, except with heads veiled. The rest of the body is sharply defined, for the torch shines on every part of it and brings it into the light. The crown of roses should be praised, not much for its truth of representation--since it is no difficult achievement, for instance with yellow and dark blue pigments, to imitate the semblance of flowers--but one must praise the tender and delicate quality of the crown. I praise, too, the dewy look of the roses, and assert that they are painted fragrance and all. And what else is there of the revel? Well, what but the revellers? Do you not hear the castanets and the flute's shrill note and the disorderly singing? The torches give a faint light, enough for the revellers to see what is close in front of them, but not enough for us to see them. Peals of laughter rise, and women rush along with men, wearing men's sandals and garments girt in strange fashion; for the revel permits women to masquerade as men, and men to put on women's garb and to ape the walk of women. Their crowns are no longer fresh but, crushed down on the head on account of the wild running of the dancers, they have lost their joyous look; for the free spirit of the flowers deprecates the touch of the hand as causing them to wither before their time. The painting also represents in a way the din which the revel most requires; the right hand with bent fingers strikes the hollowed palm of the left hand, in order that the hands beaten like cymbals may resound in unison." "Dionysos sails to the revels of [the island of] Andros and, his ship now moored in the harbour, he leads a mixed throng of Satyroi (Satyrs) and Bakkhantes (Bacchantes) and all the Seilenoi (Silens). He leads Gelos (Laughter) and Komos (Comus, Revelry), two spirits most gay and most fond of the drinking-bout, that with the greatest delight he may reap the river's harvest." "Athena came into heaven unarmed, in dainty robes with Ares turned Komos (Comus), and Nike (Victory) for Melos (Song)." N.B. Milton in his Comus calls the god a son of Bacchus and Circe. However this is a post-classical invention.